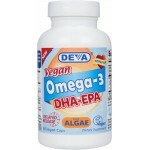 DEVA™ is proud to offer its new product that contains both DHA and EPA derived from a completely vegetarian source (i.e. Schizochytrium sp microalgae). 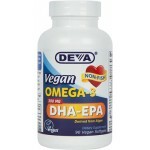 DEVA DHA & EPA oil is encapsulated in delayed release vegetarian capsules to help prevent or reduce repeat/aftertaste issues associated with Omega-3 products. Our capsules do not contain any gelatin or other animal derived ingredients. DEVA™ is proud to offer its new 300 mg potency Omega-3 product that contains both DHA and EPA derived from a completely vegetarian source (i.e. Schizochytrium sp microalgae). Algal Omega-3 oil has been commercially available for a while but it did not contain meaningful amounts of EPA. DEVA™ is proud to offer its new liquid product that contains both DHA and EPA derived from a completely vegetarian source (i.e. Schizochytrium sp microalgae). Our liquid DHA-EPA with fresh lemon flavor has an adult dose of 14 drops which provides 200 mg of algal DHA+EPA. Children dose is 7 drops. One very nice thing about this product is the fact that it can be mixed with food or smoothies since it is a liquid with no capsule. DHA, also known as docohexaenoic acid, is an omega 3 essential fatty acid. 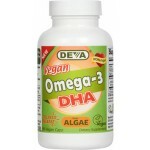 Unlike fish oils on the market the DHA we use comes from algae oil, which makes it a true vegan alternative. DEVA™ delivers high quality, potency and affordability all in one bottle. Our Vegan Omega-3 DHA oil comes in Vegan capsules with delayed release properties. 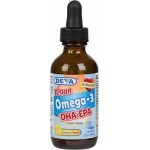 As an alternative to fish oil DEVA Omega-3 DHA is appreciated by vegans, vegetarians and anyone who would like to benefit from DHA as derived from algae. 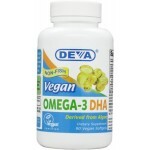 DEVA Vegan Omega-3 DHA is a quality product derived from microalgae and packaged in non-animal softgels made from plant sources. 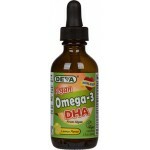 This makes a great alternative to DHA derived from fish and can be confidently used by vegetarians and vegans alike. Vegans may be particularly prone to diets low in long chain omega-3 fatty acids (i.e. DHA & EPA) unless they are careful*. Copyright © 2019 Deva Nutrition LLC - Vegan Vitamins. All Rights Reserved.